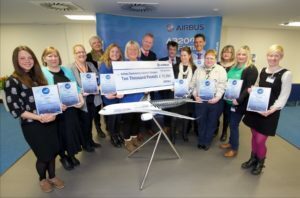 Thank you to everyone that took the time and effort to buy copies of the Bristol Post and collected the coupons for us to win a cash prize in the Airbus Community Awards. We are pleased to say we were one of the runners up and won £500! Our Chairperson Lisa and Fundraiser Amanda attended a special awards ceremony at Airbus in Filton to collect our prize. We were up against some stiff competition from much larger groups, but we won due to all your support so THANK YOU!